Making a lifestyle change, a recently single, 50-year-old client was relocating from the east to Fountain Hills, Arizona. She landed in a nice single-family home with a spectacular view of Four Peaks mountain and the world-famous fountain. The single-level house is perfect for her to downsize to and will be suitable to live in throughout her golden years once the master bathroom is remodeled for Aging in Place (future project). 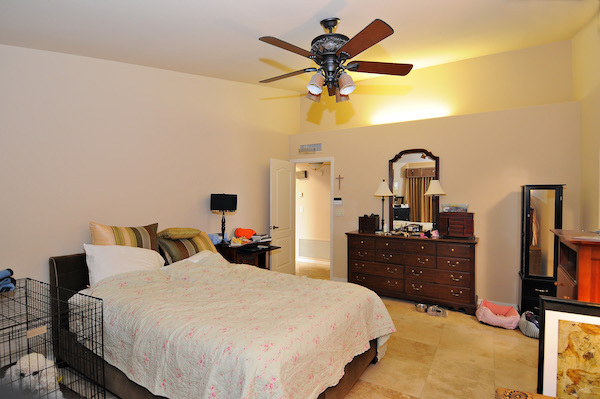 The immediate plan was to do some updating and remodeling to achieve the contemporary look desired to make it her home. 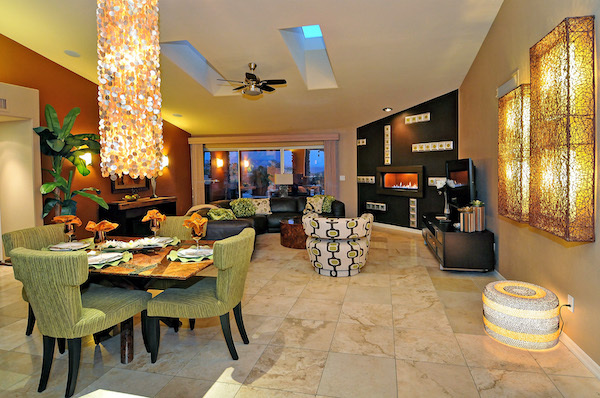 Initially, the client’s Realtor referred a contractor whom she hired and entrusted to build a contemporary fireplace to replace an existing Southwest-style beehive fireplace, prior to her relocating. Once she arrived, the contractor proudly presented her with his interpretation of contemporary, which wasn’t even close to what she had in mind. Unfortunately, she learned the hard way (time and money) that contractors are not designers! That’s when I was hired. As always, I took time to learn and understand what the client wanted. Above all she wanted that contemporary fireplace, but she also dreamed of a warm, comfortable, contemporary great room with an area for dining, new furniture, and a better furniture arrangement for the great room and master bedroom. After translating the client’s objectives into design concepts, I presented my custom fireplace wall design and furniture plan drawings, along with furniture, fixtures, window treatment, fabrics, materials, and color selections for approval. Aging in Place design was transparently incorporated with lighting and in the furniture plans, to help prevent falls and provide wheelchair accessibility, should it be needed later. The client was excited to see the plans and what everything would look like, before it was constructed or installed. 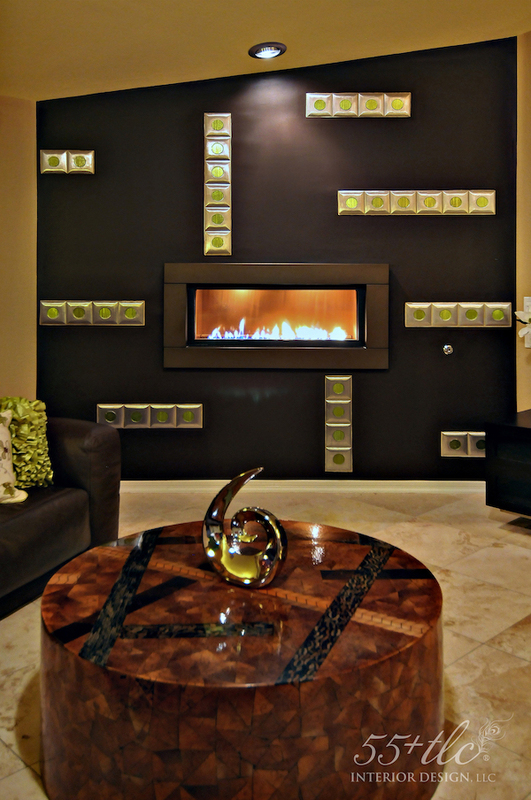 The new, dramatic, contemporary focal point fireplace wall is surrounded by an inviting, large leather sectional sofa. A beautiful cascading Capiz shell chandelier tops a custom dining table made of organic materials, creating an appealing dining area. 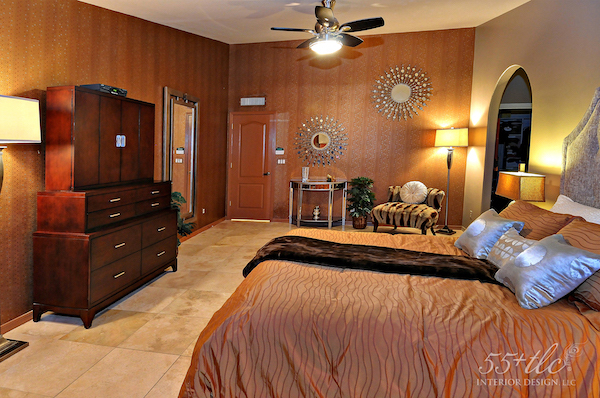 The redesigned master bedroom has the warm, glam look and feel the client loves. She is very happy with her remodeled space and pleased that it earned a Design Excellence Award from the American Society of Interior Designers. As Holocaust survivors in their 90s and not able to get out much to visit one another, Dr. Barnes wanted to find a way to enable his mother Rose and aunt Mary to live together as he knew it would bring them companionship and great joy. Rose was recently widowed and no longer happy at the Scottsdale senior living community where she’d lived for eight years. She wanted to move. 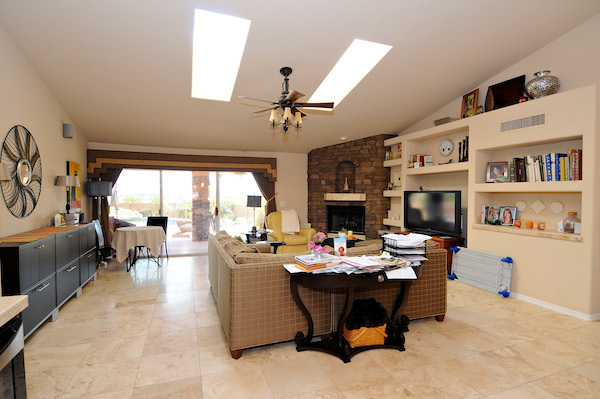 Finding another nice senior living community wouldn’t be difficult, but Mary lived in her own Scottsdale home, loved it and did not want to leave. So, Dr. Barnes wondered whether Mary’s home could be re-designed and remodeled for aging-in-place to make the home safer and accommodate the ladies (Rose has mild dementia and Mary has Alzheimer’s) and a full-time caregiver.